Australian fleet buyers have signalled a switch to electric vehicles (EVs) in the next two years, on the back of a unique EV Drive Day convened by the Clean Energy Finance Corporation (CEFC). The EV Drive Day brought together 60 fleet buyers and managers from 41 organisations, who were given the chance to test drive electric passenger and light commercial vehicles. With 13 models available for testing, the event represented the largest collection of EVs in one place in the Australian market. Collectively, the drivers completed 180 laps of the three-kilometre Lakeside Drive track at Melbourne’s Albert Park, giving them a chance to experience the performance options of multiple vehicles. 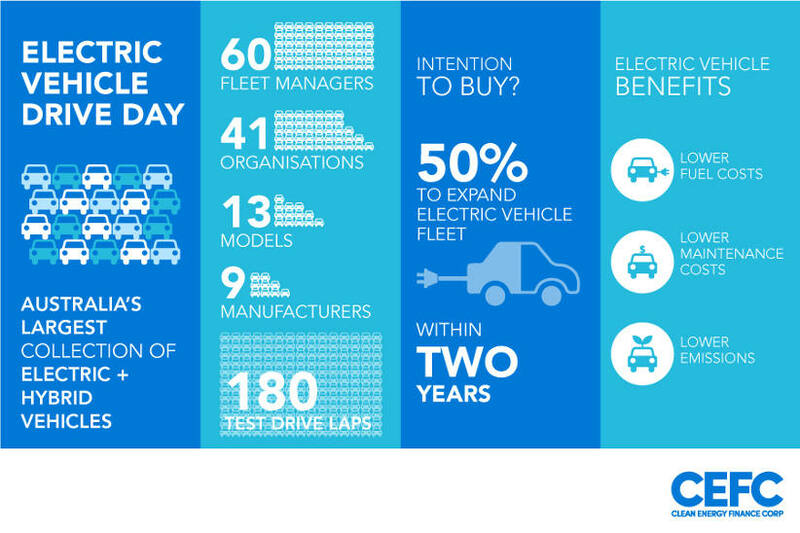 In a post event survey, the fleet buyers and managers were asked about their intentions regarding electric vehicles: 50 per cent signalled the would include EVs in their fleets within 12-24 months, and 38 per cent forecast they would have more EVs within three months. The fleet buyers and managers were also asked to name the main attraction of EVs, identifying reduced fuel and maintenance costs, as well as lower emissions. Potential concerns about switching to EVs included charging infrastructure and the upfront cost of EVs. CEFC CEO Ian Learmonth said: “Electric vehicles offer an exciting opportunity to tackle our greenhouse gas emissions, from family cars through to light commercial vehicles and heavy-duty trucks. We see fleet buyers and managers as having a critical role to play in accelerating the switch to electric vehicles. They have strong purchasing power, which can help drive down costs. With their focus on operational efficiency and cost, they can also help demonstrate the benefits of electric vehicles compared with diesel and petrol-powered engines. Mr Learmonth added: “The EV market is maturing rapidly, as demonstrated by the large number of EVs available at our EV Drive Day. We’re also seeing major investment in the essential charging infrastructure, which will give drivers increased confidence about the suitability of these vehicles. The EV Drive Day was co-sponsored by the Victorian Department of Environment, Land, Water and Planning, and supported by the Australasian Fleet Management Association (AfMA), JET Charge, Chargefox and the Royal Automobile Club of Victoria. Attendees included nine manufacturers, as well as fleet financiers and rental and car share companies. In Australia, an estimated 19,000 businesses operate fleets with 20 vehicles or more, representing more than 2.1 million vehicles according to AfMA. AfMA Executive Director Mace Hartley said: “The EV Drive Day was a great opportunity to give fleet buyers hands on experience with so many of the new passenger models coming to the Australian market. We’re particularly excited to see the next generation of electric and hybrid vehicles now becoming available, with more affordable prices likely to increase their attractiveness to buyers. “Another very important development in this market is the increasing range of commercial vehicles now available, from smaller-scale buses and vans to heavy duty trucks and electric garbage trucks. We’re also seeing increasingly advanced technology and safety features that have important benefits to fleet buyers, alongside the benefits of cutting vehicle emissions. The CEFC has identified lowering transport-related emissions as a key priority in efforts to reduce carbon emissions across the Australian economy. Transport accounts for almost 20 per cent of Australia’s greenhouse gas emissions, or around 100 million tonnes of emissions each year. The CEFC has committed almost $43 million to support the purchase of electric and plug-in hybrid electric vehicles for individual, small business and fleet buyers. In addition, through the Clean Energy Innovation Fund, the CEFC is financing start-up companies targeting the EV market. One of these, Melbourne’s SEA Electric, showcased an electric garbage truck at the EV Drive Day. New modelling commissioned by the CEFC and ARENA found that EVs could represent 90 per cent of all cars and light commercial vehicles on Australian roads by 2050, requiring $1.7 billion in private investment in new charging infrastructure. Energy specialist Energeia said increased EV sales would require a combination of policy incentives such as upfront financial incentives, government fleet purchases, and changes to the regulation of vehicle emissions, fuel efficiency and vehicle import regulations. Increasing model availability to allow consumers to find vehicles within their budget was also critical, as was public-access charging infrastructure to complement home charging and support vehicle charging for long-haul trips and occasional top-ups. Read more in our Clean Energy Snapshot on EVs.